My goodness these last few days in the UK have been a volatile, roller-coaster ride. I can't quite believe what's happened, and, whilst I don't blog about politics, I have to say it's all a bit unsettling. The old certainties seem to have gone, and we're facing a whole new ball game for which they've still got to write the rules. So I've been casting around for a few every-day gems that rock my world, and make me smile regardless of the maelstrom outside caused by the Neverendum. If I focus on the small and the familiar I'm sure everything else will be okay. And there's one little chap who's always guaranteed to make me smile. As it happens he's just had a snazzy new haircut. He hates going to the hairdresser, and gets really twitchy when they try to trim his ears. They can do all his other bits, but not those ears. 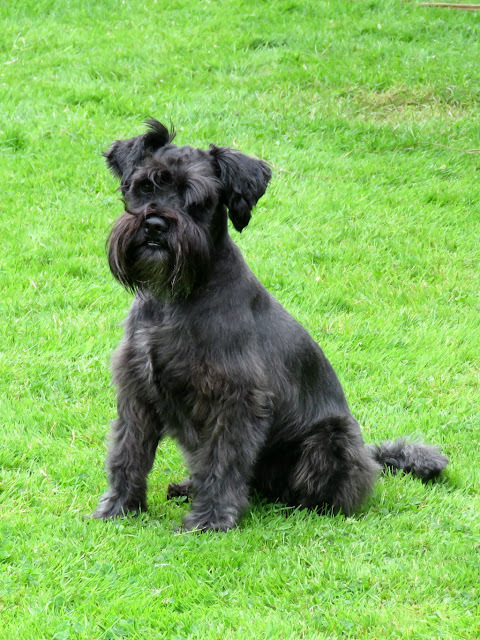 As a result we seldom end up with a perfect cut, but for my money he's looking very handsome and I'm not too bothered if we haven't achieved the breed standard of perfect Schnauzerdom. And then there's this other little chap who also (mostly) makes me smile with his madcap schemes and ideas. 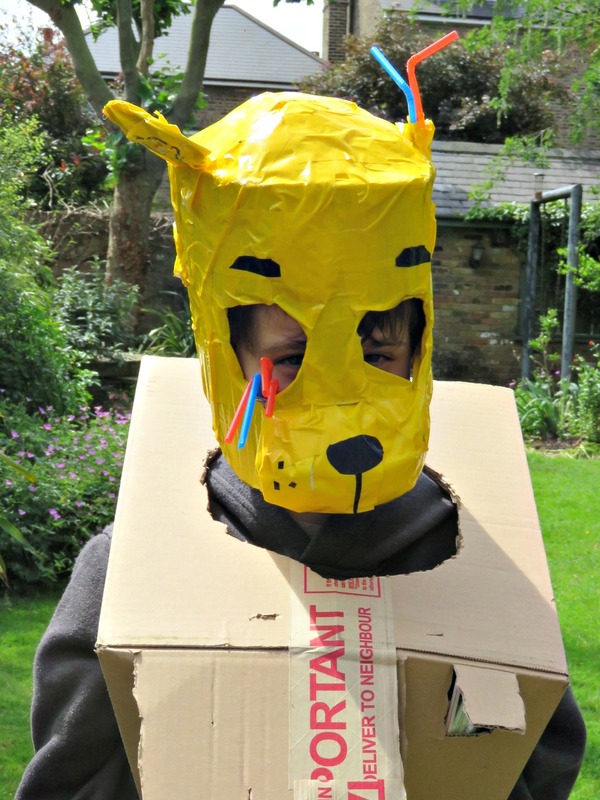 He's one of life's enthusiasts, and he just l-o-v-e-s making things out of cardboard boxes and duck tape. 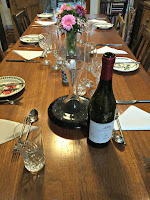 We gathered some good friends in on Saturday night for a mid-summer dinner, and I enjoyed cooking up a storm, and baking for Emi's school fair which happened earlier in the day. 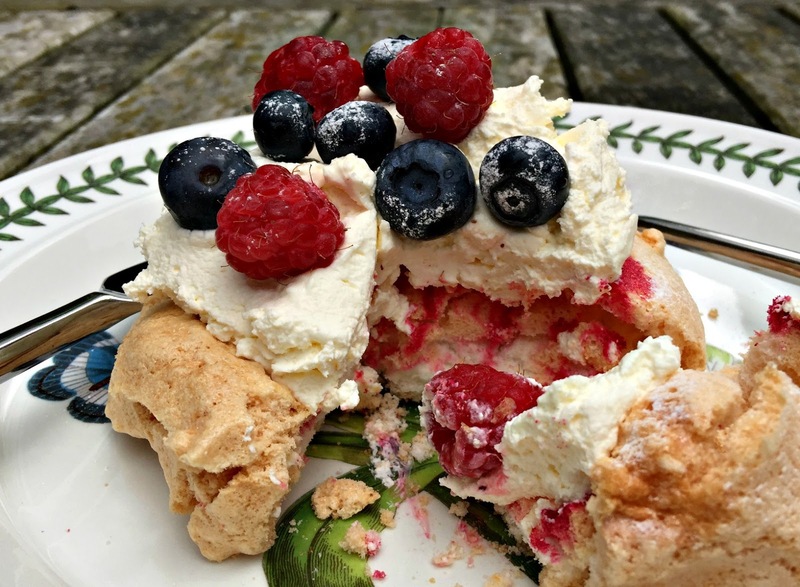 I made pillowy meringues for dessert that were crisp on the outside and chewy on the inside. Topped with fruit and whipped cream, they shouted summer! 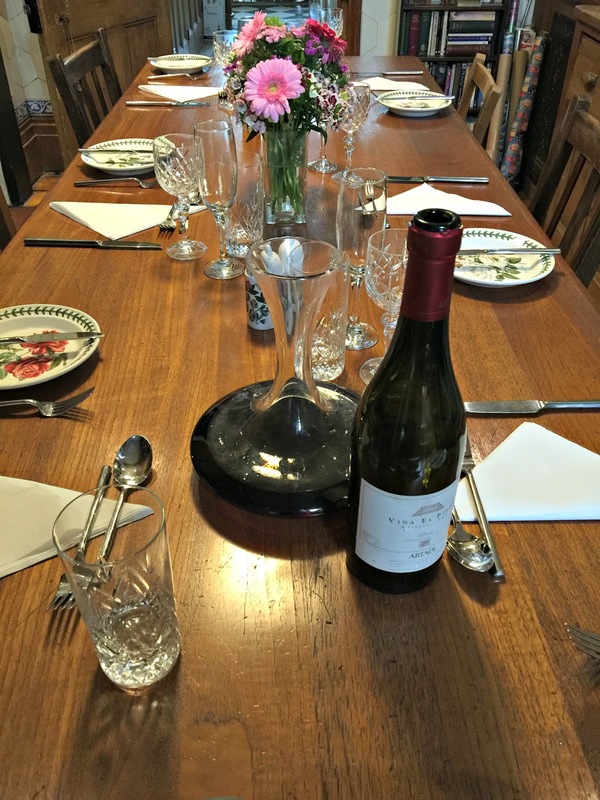 As I hadn't got the house back together again after the builders we ate in my study on the basis that it was the only room (with a table) that hadn't been turned upside down. And that gave me a very good opportunity to tidy up in there and cull the mountain of redundant paperwork that I'd not been efficient enough to file in the recycling bin. I'm now determined to operate one of those clear desk systems. I'm going to dispose of all unnecessary clutter at the end of each working day - well, at least that's the idea. It'll probably last for a week until I run into my next deadline crisis. 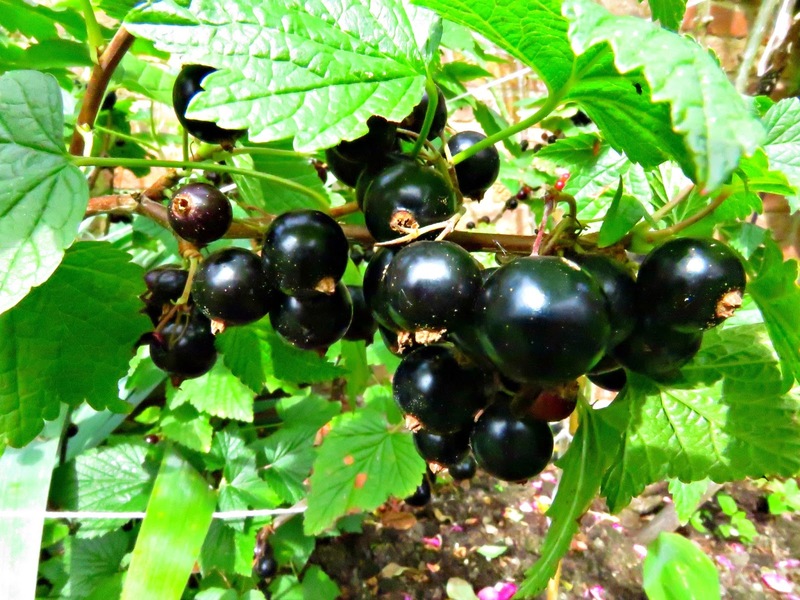 My blackcurrant bush has produced another good harvest. I picked them earlier today, and this afternoon I'll get going on some mid-summer jam-making. Blackcurrants really are the perfect fruit crop if you live in the UK, and suffer from its unreliable weather. They never mildew or fail to ripen and blackcurrant jam is the very easiest jam to make. Their high pectin content always produces a perfect set without having to go messing around with setting agents. If you're interested check out my Black Currant Jam with Vanilla and Star Anise recipe. So later today, when Emi comes home from school, our house will smell of jam-making: rich vanilla, mixed with the fruity bouquet of the black currants and the aniseed notes of the star anise - the perfect smell for a summer kitchen. My roses continue to gladden my days. I've written so much about David Austin's delightful Munstead Wood. I promise you he's not giving me any commission or backhanders to push this beauty. Maybe it's able to grab my attention because I've got it planted bang outside my kitchen door, but it really is the most superb rose. It's spoilt me from early May with an array of exquisite dark red flowers, and it's still going strong. When the sun shines, and I've got my kitchen door open the fragrance wafts in on the breeze; it's the quintessential smell of high summer. The foliage is dark and healthy with just a tinge of red to the leaves. I'd tried to partner plant it with some clematis. I chose a deep purple clematis that would have given the maximum oomph of contrast, but one morning I came out to find that the previously healthy-looking plant had died in the night. 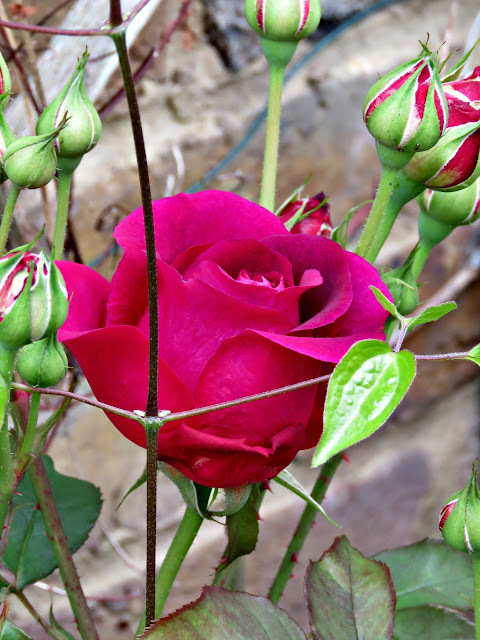 But then yesterday, when I took this photo, I noticed that the root had thrown up some fresh new stems that were happily growing through my rose. Result! I've also been busy culling slugs and snails. The commentators say that there is a super-abundance of these slimy characters because of the mild winter. Instead of doing the decent thing and dying off without a fuss, they've spent their extra over-winter time breeding with one another, and we now have an epidemic of them chomping at our lupins. I got so fed up with them that I bought some nematodes over the internet to sort them out. 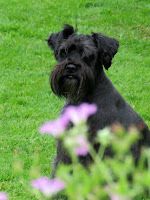 With the WonderDog and the likes of Slinky Paws spending time in my garden I've been reluctant to use slug pellets that might be harmful to my four-legged friends. Every brand of slug killer down at the garden centre carried a health warning for pets, so I asked one of my gardener friends what to do. 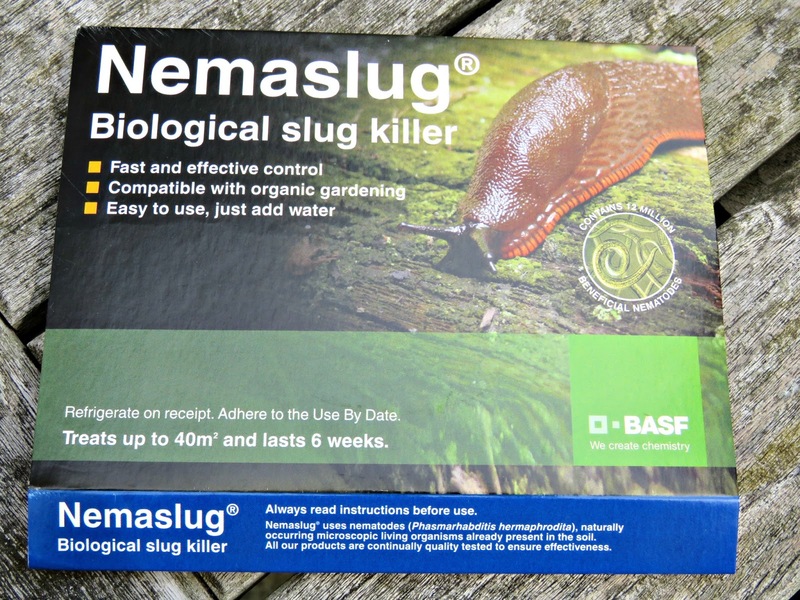 She recommended nematodes, which are microscopically small worms that the slugs ingest with fatal consequences. They're guaranteed to be safe for pets. They come in the form of a powder that you have to keep in the fridge until you're ready to use it. Worms in the fridge - eek! It has a shelf-life of just a few weeks. You make a stock solution dissolving the powder in a limited volume of water, which is then diluted and watered over your garden. Unwisely I only bought enough for my flowerbeds. If you're planning on going down this route I'd advise you to buy enough to also water into your lawn as quite a few slugs will be hiding out in the grass. With that caveat, however, I'm happy to report a radically reduced number of slimy pests outside. Result! And, on top of everything we've got the summer holidays looming large on the near horizon; just another couple of weeks until Emi's school breaks up, and then we're so outta here! Awwww your dog is adorable. Love the costume your boy made, he's very creative. Such pretty roses. I don't think I've ever eaten a current before. 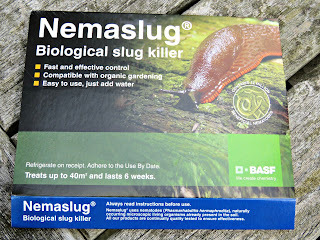 Also never heard of the stuff to kill slugs (I use the pellets)May have to see if that's available around here.